All these things she's revealing to sell her show, eh, issokay! Jada Pinkett Smith has spilled more secrets about her 21-year marriage to Will Smith. 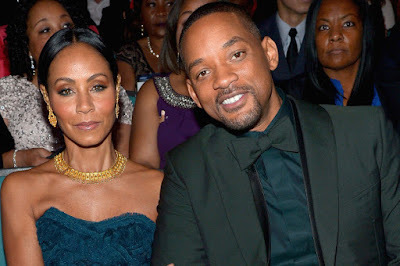 The Hollywood couple walked down the aisle in 1997, but not because Jada, who was three months pregnant with Jaden at the time, wanted to. She went on: "My first trimester was horrible. And I was so upset that I had to have a wedding. I was so p***ed. I went crying down the freaking aisle, I cried the whole way down the aisle." The mum-of-two said she doesn't agree with the "rules and ideas" of a marriage union. "I just never really agreed with the construct [of marriage]. I just don't agree with it. I still don't. Til death do us part is real for me, but all of the rules and all of the ideas. This title 'wife,' the accepted conventional definition of wife in the paradigm - I'm not that." Jada's mum, who also appears on the show, accepted that she pressured her into getting married. "I'm sorry that I didn't respect your wishes," Adrienne told Jada. "It was totally a selfish. It was, 'I'll never have that experience of my daughter getting married,' because you were my only child. The wedding was horrible. Jada was sick, she was very unpleasant. She didn't cooperate with anything. She was having all that morning sickness." However, for Will it was a completely different story as he always knew he wanted to get married and have kids. "There wasn't a day in my life that I wanted anything other than being married and having a family. From Literally five years old, I was picturing what my family would be," he said. On the show, the Girls Trip star also recalled the moment she knew she was pregnant with Jaden.